Looking for a better-for-you spread that’s quick and creamy? Our Zesty Avocado Spread combines ripe avocado with cream cheese, lime juice, garlic and pepper - the perfect appetizer spread for crackers, pita chips or toasted baguette slices. Mix first 5 ingredients until well blended. Spread 1-1/2 tsp. 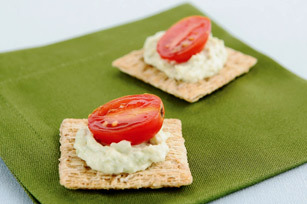 avocado mixture onto each cracker; top with tomato half. To help prevent the avocado spread from turning brown, place plastic wrap directly on surface of spread before refrigerating. Chop 1 small seeded jalapeno pepper. Add to avocado mixture before chilling. This great-tasting spread can be part of a healthful eating plan.